As a recent graduate of a Florida high school (class of 2009) school lunch food is fresh in my memory. I’ve only recently began following Mrs. Q’s blog, but it’s made me rethink my lunch time experiences. As a future teacher, I don’t want students coming into my class sluggish and tired, possibly still hungry, from bad school lunches. My elementary school lunches weren’t all that bad compared to how they are today in elementary schools, middle school still wasn’t very unhealthy except for the occasional rubbery pizza and bland veggies. But middle school was also the introduction to the snack food carts. The tall racks full of chips, snack cakes, and Pop-Tarts, next to the Gatorade and pink lemonades. I indulged in these every once in a while when I had extra money, but I still had my hot lunch. Then I made it to high school. In my school’s lunch room, there was a hot lunch line where you could get the usual “rubbery pizza and bland veggies.” Then there were three a la carte lunch lines. One sold ice creams scoops and all the toppings to go with it. While the other two served anything from pretzels and chicken tenders to Pop-Tarts and Doritos. 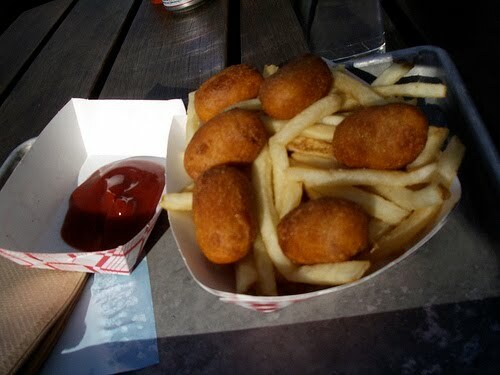 If I didn’t bring something for lunch, I waited almost my whole lunch time in one of those lines to get some mini corn dogs and fries. Half the time the corn dogs were burnt and the fries not cooked all the way. I lived off of that or chips and snack cakes up until my sophomore year. 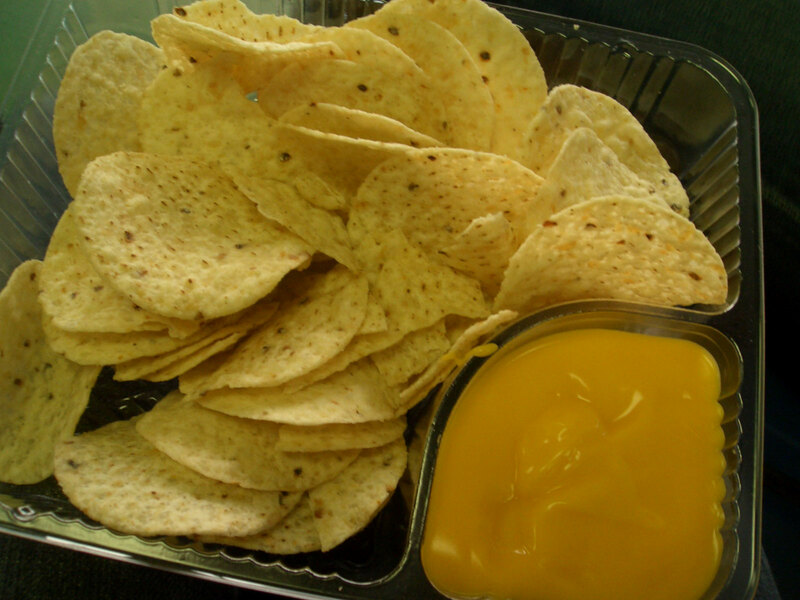 Then junior year I turned to ordering the nachos and cheese every day. I’m not sure why I or anyone else ate them, the cheese “product” was always a neon color and the chips were stale. And I knew it was all bad for me. But it was there, so I wanted to eat it. Recently I went back to my high school to visit a teacher and decided to see if the lunch was any better. Not at all. My teacher and I were talking and both knew if they’d get better, healthier, fresher food in the hot lunch line and got rid of the choices from the al a carte, maybe replacing it with a good salad bar, as well as making water cheaper, then kids would eat much better and function at 100% in class. Great post! I love that as an up and coming teacher, things like this already worry you! Your school's lunch definately reminds me of how mine were when I was in school. My choice in middle school? Funyuns covered in nacho cheese, a three muskateers, and a really big Dr. Pepper. The reason? Because it was there…and I could. I finally started to "get it" by the time I was in high school…but my choices were still a far cry from healthy. Had there not been so many of the bad choices, I would have eaten the better ones…I was hungry. However, if you have better for you foods and veggies in one line and snacks and cookies at the other..I'm gonna get in the snack and cookie line, everytime. I agree with everything here except making water cheaper. Bottled water should be banned. Get a reusable bottle or cup, keep it in your locker and take it to lunch. Bottles of water are never cheap, no matter the cost. There's the making of the plastic, the transportation and hopefully the recycling. Tap water is good. And if it's not, well then that's another problem. I think the behavior aspects of a good lunch are a real concern. I know with my kindergarten son I see problems if he eats school lunch 2 days in a row. Too much salt, fat and carb and not enough colors of the rainbow. This really reminds me of when I was in high school (ten years ago now). We had hot lunch and a la carte. When I didn't get hot lunch I got cookies or pop-tarts and a drink. When I did get hot lunch is was really good. I think they still cooked in my school because along with the standard chicken patties and burgers, they also had full meals with a starch, veggie, meat, bread and milk. The turkey gravy over mashed potatoes and a mexican dish were my favorites. I wish I could have one of those lunches again!! P.S. Great blog, I love it! My lunch diet in High School was completely awful. The go-to lunch for almost everyone was Cheese Filled Breadsticks with nacho cheese sauce for dipping – or fries and cheese. Every day. I can NOT immagine, now, eating fries every single day. I used to sometimes just buy a Little Debbie brownie and eat that so I had more time to walk around and talk with my friends instead of just sitting and eating the "whole 20 minutes". Another popular lunch was the giant chocolate chip cookies. In Junior High I used to get that every day. I do remember there was a line for other types of food but I didn't really want to fill up so much on a huge plate of cafeteria spaghetti and then have to run a mile in gym class or something awful. Offering healthy meals is so important but even more so, even just offering healthy snacks! String cheese? Yogurt? Some fruit? Tiny side salads? Sliced veggies with a bit of dip or something? Great post! I think it is so important to reiterate that kids will eat what is there, and no matter what nutrition standards/laws are currently in place, it still allows for this unhealthy and generally not even tasty food. I am a grad student who worked as a substitute teacher for three years in NV. I often taught at my former high school (even completing my student teaching there before I received my degree), and I distinctly remember what I normally ate for lunch while I was in high school: chicken fingers, cheese fries, and on fridays, pizza hut pizza. Those same foods are still there. As an adult, there are many processed foods and preservatives that I have completely cut out of my diet, so when I taught there, I was forced to get up an extra fifteen-twenty minutes early to prepare a lunch that I could eat, something that I think almost all teachers can relate to. For me, this meant getting up at 4:45AM instead of 5:00AM, and it was manageable but certainly not ideal. Why do I bring this up? To illustrate how unfair it is to expect kids to pack a lunch if the available choices are not to their liking. Schools need to provide adequate nutrition because it is the only way to keep kids alert, and it is insensitive to think that students, even ones from households in higher socio-economic brackets, need to do this on their own. If teachers don't want to eat this food, what are we doing feeding the next generation with it? We as a nation need to remember that school lunch is often the only full meal many children get in a day, so why not make it great? Sure, it may cost more money to make good food on site, but student productivity would increase tenfold, and that is good for everyone! I too remember the a la carte items at my school. I graduated high school in the Houston area in 2004 and remember eating the giant cookies (at least two) every lunch for probably a month. If it wasn't that then it was pizza, sausage kolaches or chicken nuggets dipped in bbq sauce and mayo (it was better than it sounds). And of course we had vending machines and soda machines galore! It wasn't until my senior year that they implemented not being allowed to buy a soda until after school…which I don't think made much difference. Looking back, I really enjoyed the food at the time. But now, I would not be able to get away with eating two giant cookies in one sitting (I was active in drill team so I ended up working it off at the end of the day, ha!). Hind sight is 20/20 I guess. I would not let my kids eat what I ate. I think this is a great thing that Mrs. Q is doing. It's calling attention to something that I think people have been turning a blind eye to for a long time. Keep up the good work, and hopefully when I have kids they will have healthier choices when they go to school…or else they will be taking their lunch every day! Thank you! And that was exactly my point. And if we have to have nachos or other things, then make them healthier! Jamie Oliver did it on his show last friday…It doesn't help that my high school had frequent club fundraisers where they sold all kinds of candy. My British boyfriend was appalled at my school lunches when I told him, as he was coming from Jamie Oliver lunches! Awesome post Nena! I too am a future teacher (graduated from high school in Ohio in 2009). I hope that by the time I am teaching in a school the lunch options will be much healthier. My friends always complained of stomachaches after eating and now that I am in college, my boyfriend has been having severe stomach issues since he began eating the food in the dining hall (and they have supposedly won awards for their food?!?!) I think this school food revolution should extend to colleges as well. Most college dining in the U.S. get their food from 1 of 2 major suppliers and it is all very processed! More than that, I believe colleges should post ingredients and the source of their food on websites. As young adults, we are learning to make conscious decisions about what we eat – and if you don't commute and are a freshman chances are you are REQUIRED to have a meal plan and eat what the school is serving. I have a meal plan that I am required to have, but that I am wasting because I can't eat something if I don't know what's in it! I so agree with you! I grew up in a healthy house that treated treats like treats. We had soda pop on special occasions, and there wasn't a lot of processed food around. I packed my lunch everyday because I didn't want to waste my allowance on icky school lunch so my diet was mostly healthy. Then I went to college. I lived in the dorm so I ate in the cafeteria which was full of junkfood. Sure, there were some healthy options, but it's hard to choose water when there are seven different kinds of free soda pop with much prettier labels right next to the water fountain. I often caved and drank the sugar water. For the first and only time in my life I gained weight. Then summer came, and I moved home to work and earn money for school. My diet went back to healthy food and drinks and the weight fell off immediately. Since then I have had more self-control in cafeterias, but it's still hard. It would be so much easier if meal time in the cafeteria excluded treat food that should not be part of a regular meal. It's so great to hear a (recent) student's perspective, especially one as articulate as Nena. It is refreshing to know she realizes now that making unhealthy "snack" choices available meant that students ate snacks for lunch. And that she now feels that those unhealthy choices shouldn't be given. It is a nice contrast to the kids at School Lunch Found Guilty. I don't have anything against the kids, and I like their project. But sometimes they prove the point that kids shouldn't dictate what is served, because there are many meals that seemed healthy to me which they decided were Guilty. They want junk instead and are primarily concerned with food that conforms to their (not always healthy) tastes. Yep me too: fries and Little Debby snack cakes cost less than the "Panther Special", so I could pocket a bit of change each day. Maybe we overestimate a teen's ability to make good choices. I agree. HS kids are still maturing and I believe that the temptations need to be removed in order for kids to make sound nutrition choices for school lunches. Great guest post! It's great to hear it from a recent graduate and teacher-to-be! I also recently graduated (2006) and clearly remember that most of what I ate was fried. Greasy pizza, huge burritos, popcorn chicken and shrimp, fried chicken sandwiches and to top it all off: soda and french fries. During my junior year they took away the soda fountain and replaced it with gatorade and powerade (just as sugary sweet), but kept all the soda machines on campus! And the worst part…we had "fresh" (as in lumps of frozen dough we stuck on baking sheets) cookies every day, sold 3 for $1. Often days I ate a whole package, a Dr. Pepper, and nothing else! The salad bar was a dismal sight. If you put that gross food there, the kids will eat it. If you put healthy food there that tastes good, they'll eat that instead! No matter what is done, it's going to be a long row to hoe. Are students going to want to give up these "tasty" and oh so addictive foods in favor of healthy foods. In most cases, likely not. But speaking as someone who has recently made the move from even just one or two processed, prepackaged foods per day, to nearly all homemade meals, including sauces and whatnot, it really does make a huge difference in one's clarity of thought, energy levels, and even in the behavior of children. I have two girls, ages 3 and 1, and I can tell you, even though they're still your typical toddler and preschooler, they are much calmer, happier, and focused when our diets are "clean." If one of their grandmother's, aunts, or whoever gives them a "treat," be it a big ol' glass of chocolate milk, cookies, a "happy" meal, or candy, you'd swear they were on something. I mean, they buzz around, shrieking their little heads off as they run throughout the house nonstop and jumping off of things before they crash and spend the next two or three hours bawling for no reason other than they feel awful. It happens every time, and I know my girls aren't the only children this kind of mess does this to. How is giving the students "food" that brings about these types of side effects conducive to learning? Sure they might not eat – as much – of the fresh vegetables, fruits, real meats, and whole grains first off. But taste buds can be trained. It just takes multiple exposures to new foods. Thank you for your insights Neena. When you said, "But it was there, so I wanted to eat it." pretty much says it all. I didn't eat very healthy when I was in school. In elementary, my parents packed my lunch. In middle school, I bought two cookies, chips and coke from the vending machines for lunch. High school was an odd mixture of not eating, sometimes getting a hot lunch, sneaking out with friends to Carl's Jr. or bringing my lunch. And then there was senior year, when they installed an ice cream cart in the students' lounge. Some of us would eat entire pints of ice cream for lunch, just because we could. It was almost like a badge of honor if you finished one in the 30 minutes we got to eat. I'm trying to eat healthier now, though it certainly hasn't been easy to transition from the junk I used to eat to healthy, real food. Some say that's all kids will eat. Not true! If they are hungry and they have to eat healthy…they will! thanks for your insight as a guest blogger! Freshman year of high school, they took soda out of the soda machines but let the just as sugary, if not even more drink in the machines. I stopped drinking their iced teas because i actually found mold in several of them! Thankfully their water was cheap (50 cents) but only sold at the cafeteria. Recently I went to a friends house. She still has two brothers in school. Of course I checked the menu. Who the heck said cinnamon glazed french toast met the guidelines. I would LOVE to know. I actually found, besides that one, that they are trying to serve better foods. When my daughter was in Junior High they had a snack bar in addition to the regular cafeteria line. She was also hoping to be one of the first in line to get a chicken salad from the snack bar. It was the only healthy choice on the menu and her favorite. Guess how many they had every day?? 4 max. Yep, only 4 for approximately 300 kids. And if you weren't there first you didn't get one. I think the schools don't give kids enough credit. Yes the kids will choose fries, nachos and pizza over the regular cafeteria fare, but give the choice of a fresh salad I think many schools would be surprised at the response. Water is cheaper. It's free. It comes out of a tap and you drink it. Great post! You have a good point about kids coming back to class sluggish while struggling to digest a meal of highly processed food. to 9:23 anonymous: potable water from a tap, sadly, isn't always available in school. You need a cup or bottle, for one, and a safe water supply. If the water from the fountain tastes bad, you buy bottled. to Erin and Elena: I absolutely agree that college food needs attention as well. I spent two years at a public university, and the food was legendarily awful. I eventually learned it was actually provided by the same contractors who provided the state's prison food. Anyone without a kitchen was required to have a 19-meals-a-week plan. Even with a kitchen, you still had to at least buy their "flexible spending" plan for a couple hundred dollars that could be used in the cafeteria, student center, or campus convenience store. My first year, I had no kitchen. 3 days of the food (and the associated severe GI distress) was enough to make me swear off the cafeteria for good – my roommates (who'd been there a year longer) tried to warn me, but I didn't listen. We all lived out of our microfridges. The only campus food I could eat was at the student center, and even then I had to watch them like a hawk – sometimes they didn't change their gloves between putting my raw burger on the grill and getting my bun, and i'd have to tell them to get me a new plate. They had a salad bar, but even the cafe staff wouldn't eat it – it wasn't fresh or properly maintained. Thankfully I was close enough to go home weekends, so 2-3 days a week I'd have decent food, but mostly I ate burgers/fries/sandwiches from the student center food court, PB&J, EasyMac, and frozen prepared foods. The next year I had a kitchen. The required meal money? The vast majority of it I spent at the end of the year, cleaning out the convenience store of pasta, soup, and cereal for the local food pantry. @Claire: Why is it unfair to expect kids/parents to pack a lunch if they don't like the school food? In an ideal world where the school food is fine, the school shouldn't have to cater to picky tastes. In a world where the school food is crap, it's unfortunate, but I still don't think unfair for kids to bring lunch. Am I not seeing something? You can pack it the night before and keep it in the fridge, then you won't have to get up earlier. That's what I did in High School. In elementary school, my mom packed my lunch for me, and she worked full time. I kept the lunch in my locker/cubby and it kept for the few hours before lunch. It's not unreasonable. I may not have had a lunch with a hot component and a cold component, but why is that a necessity? @KendrafromTX: You say you made bad choices in school, yet you wouldn't allow your kids to do so. Do you think if your parents knew what you were eating in school, it would have made a difference? I don't know if you had healthier choices in school, but I don't know if it would have mattered. Kids that don't know any better will go for the junk if its offered. There's nothing stopping kids from bringing junk food with them, but I really don't think the school should offer it for sale. High school students definitely should not be left to their own design, when it comes to eating. when i was in elementary school, we had to sign up for lunch by the week.. and teachers would come around to make sure you ate your entire lunch. (entree, 2 fruits/veggies, and bread or dessert) we always had to have four things plus milk on our tray..and many kids in elementary school just don't eat that much. The food was heat and serve..with the exception of Dr. Suess's Birthday.. green eggs with ham cut up in it.. yum! I often had my mom pack my lunch..mostly a pb&j, applesauce, sometimes chips, and milk. Middle school was mostly an extension of elementary school, I went to a Catholic school whee K-8 had the same lunch and were all in the same building. While I got hot lunch more often in 6-7 grade because.. every one else did.. In 8th grade I became obsessed with food. I would pack half a pb&j and applesauce….a bowl of fruit….a banana… a yogurt… and this would be all i would eat–even on pizza party days. I had a few teachers raise eyebrows, but even at a private school no one said anything. Then high school came about.. freshman year my lunch primarily consisted of an applesauce i threw in my backpack..breakfast? ha. Sophomore year's lunch consisted mostly of a packed pb&j..nothing else. Junior year? I began buying a bagel or a bag of sunchips for lunch via the ala carte stand, and then… I thought I was getting fat, so lunch senior year was either a light yogurt or a bag of carrots. Some days I didn't eat anything. The best part? no one noticed. The worst part? no one noticed. I think this wouldn't have gone on for so long if a teacher had said something to my parents, if there would have been a rule as in elementary school where you had to take so many things and eat them. Now a college student, I have learned to love and nourish my body. I still have "eating issues" and I always will. If I eat breakfast, I grab a yogurt on my way out the door. Daily I need to talk myself into being okay with eating salad and a cup of soup or a bagel for lunch. I have to fight my urge to throw up my chef-prepared mostly healthy dinners. Schools need to urge kids to eat healthy from the start, and develop healthy eating habits, or else it will just stay with them. I'd just tell my mom "I had a huge lunch today" to explain why I picked at my dinners.. even in high school. While we want to give choices, there needs to be guidelines. hey great post there, very well written. i remember waiting in line almost the whole lunch period also, then sometimes not having enough time to finish. I think the positive changes will come. I am in my 40's and remember when everyone, myself include, smoked. When I was a child you could smoke in the hospital bed! The super market, walking down the center of the mall, etc. We've come a long way, and I am confident that change will come with our eating habits as well. What we now consider acceptable we will look back on in 20 yeatrs and shutter. All of us are making it happen. Cheers Mrs. Q! Hi…My girls are in Girls Scouts; Junior and Cadet level. We are interested in getting a table @ the local Farmers Market to get folks to sign a Petition to show their support for the goal of our campaign: to give kids the school lunch they deserve. Please share some great statements and/or photos that my daughters can put on posters for our table stand. Also any good tips and/or ideas would be great, too. It was your choice to make that time, and obviously a good one that many will decide to make. Fortunately, you came from a home where there was food in the fridge to pack, a luxury not all children have. Additionally, the point is that it should be your choice whether to eschew school lunches based on preference, not necessity. Kids should have healthy, tasty options in case they would rather spend that extra time at night doing something else. Most of my students, because of their rigorous course work and extracurriculars, got well below the amount of sleep that teens need. And trust me, since I went there as a student, I know it's not for lacking of trying or vegging out. I never got more than 7 hours of sleep a night my whole high school career (pre-social networking and my home did not have a tv). That's why I never packed a lunch. When you don't even get home until 10 and have to get up at 6, like so many of my students did, schools should have a reasonable support system in place. I am not asking schools to cater to picky tastes. That would be silly as it would drive up costs even further. It is inevitable that children will not like everything they are served, but in general, a lack of consideration in the food prep is what leads to unpleasant foods (at least in most people I've encountered, including myself). So to answer your question, what makes it unreasonable is that schools are a government service meant to facilitate/streamline learning, elevate our nation, keep children out of the workforce, and foster a developmentally positive environment. If lunch becomes a hassle, then it is no longer serving our children's developmental needs or streamlining learning to the necessary extent. Also, I never said that hot lunch was a necessity. I think that "cold" lunches like in-house produced salads and sandwiches are EXACTLY what would turn school lunch around.